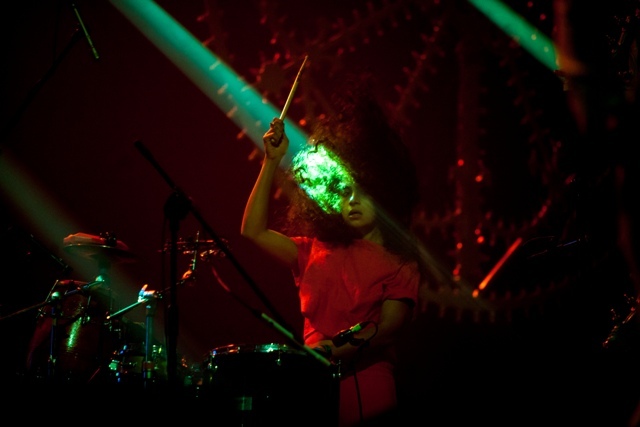 How Drummer Kiran Gandhi Began Touring With M.I.A. Behind the giant decorated wheels and a string of lights littered across the stage before Brit Sri Lankan rapper M.I.A goes on, 25-year-old drummer Kiran Gandhi is running around backstage looking for a Wi-Fi signal to help complete the homework she was given as part of her MBA at Harvard Business School. Says Gandhi, “It was one of those situations where I had to ask them [classmates] if they had my back on this, because after this [homework] I was getting on stage and then I was on the flight back and I’d be going straight to class on Monday.” It’s just another weekend for Gandhi, an Indian-American drummer who is juggling the life of an Ivy League school student with the life of a musician for one of the most popular artists in the world. As a touring drummer for M.I.A, Gandhi says she can handle everything else about the course except for the group projects and assignments. Gandhi, the daughter of an investment banker Vikram Gandhi and the founder of a global charity, Meera Gandhi, first took to drumming in 2001 at a summer camp. Says Gandhi, “There was a drum set in the theater in the camp and I used to sneak away from the group and tested it. [A guy from] maintenance actually caught me playing it and I thought he was going to kick me out but he knew how to play drums.” The same winter, her family bought Gandhi her first ever drum kit and set it up in the basement of their Manhattan home in New York City. After the weekly lessons from maintenance staff at her summer camp, Gandhi took drumming classes from middle school onwards.